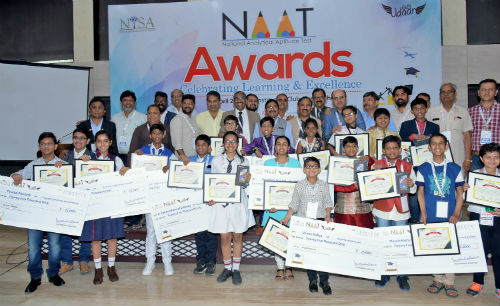 New Delhi: National Independent Schools Alliance (NISA) – a pan-India alliance of 36 state associations across 24 states comprising of 55000 schools, on Saturday organised the National Analytical Aptitude Test (NAAT) Awards 2018, to facilitate awards and scholarships to 24 outstanding students who excelled the NAAT conducted across 14 states in India. NAAT is a holistic examination designed to test the aptitude of applying conceptual knowledge to solve real-world problems and logical reasoning capabilities along with English and Maths skills. The award ceremony brought together more than 250 education stakeholders and enthusiasts, including academia, industry experts, school leaders, teachers, students, and parents to recognize the 24 top performers. The students were awarded scholarships and educational tablets to support their continuing education amidst prominent personalities, encouraging and recognizing their academic commitment. The Top 90 schools, identified through the assessment process will serve as pilot schools for NISA Holistic School Empowerment Program (HSEP). These schools will become model schools to understand how low-cost private schools can play a vital role in Indian education system.